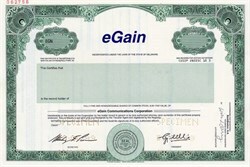 Beautiful specimen certificate from the eGain Communications Corporation printed in 1999. This historic document was printed by the Security - Columbian Company and has an ornate border around it with a vignette of the company name. This item has the printed signatures of the Company’s President, and Secretary. eGain (EGAN) is the leading provider of customer service and contact center software for cloud and on-premise deployment. Trusted by prominent enterprise worldwide, eGain has been helping businesses achieve and sustain customer service excellence for more than a decade.